The first 4 days of Verdun had been one of German success coupled by missing opportunities for even greater success. The French were battered and bruised, they had lost their front line, and 72nd and 51st divisions were all but destroyed, the 37th had almost completely broken, and to cap it all off Douaumont had fallen to the Germans. All of that sounds really bad, but the 20th Corps had arrived at the front and, even though the French did not know it yet, the front was starting to stabilize as the Germans were running out of steam. Into this situation there would be one man who was given command over Verdun and would forever be associated with the rest of the battle, than man was General Henri Phillipe Petain. Soon he would become the savior of Verdun, then the Savior of France, and then the man who led France to Victory. Through that process Petain would, more than any other single person on either side, become associated with Verdun. Today we will look at how Petain became involved with the fighting before talking about some of the decisions that he quickly made to stabilize the situation at the front. Hello everyone and welcome to history of the great war episode 69. This week I would like to thank everybody who has taken the time to leave the podcast a review on iTunes. Reviews go a long way to getting the podcast more exposure so if you are listening through iTunes and have a few moments, please consider leaving one. The first 4 days of Verdun had been one of German success coupled by missing opportunities for even greater success. The French were battered and bruised, they had lost their front line, and 72nd and 51st divisions were all but destroyed, the 37th had almost completely broken, and to cap it all off Douaumont had fallen to the Germans. All of that sounds really bad, but the 20th Corps had arrived at the front and, even though the French did not know it yet, the front was starting to stabilize as the Germans were running out of steam. Into this situation there would be one man who was given command over Verdun and would forever be associated with the rest of the battle, than man was General Henri Phillipe Petain. Soon he would become the savior of Verdun, then the Savior of France, and then the man who led France to Victory. Through that process Petain would, more than any other single person on either side, become associated with Verdun. Today we will look at how Petain became involved with the fighting before talking about some of the decisions that he quickly made to stabilize the situation at the front. The first few days of the fighting had not greatly concerned the leaders back at French high command. The Germans had launched attacks at Verdun before to try and push back the defenses and them doing it again was not a huge surprise, especially with how much the French had found out about the build-up before the battle. On the third day of fighting Joffre did send his Assistant Chief of Staff Colonel Claudel to Verdun to evaluate the situation and to send his views on it back to Joffre. The message that was sent by Claudel was mostly positive, in it he stated that he believed that the French would probably stop the German attacks after the Third Day. Even though this message was positive and pointed to the lines settling down very soon on the evening of the third day General de Langle de Cary, the commander of the Army Group in charge of the Verdun area, asked for permission to abandon the Woevre Plain. The French positions on the plain were to the east of the main fighting at Verdun and the plain represented a salient out into the German lines which de Langle believed made it vulnerable to future German attacks, even though it had not been touched so far in the fighting. When Joffre received this request to abandon the plain he responded by saying that it was up to de Langle on whether or not that decision should be made because as the general on the scene "you are the sole judge of the necessities of combat." In Verdun The Lost History John Mosier goes on to call this decision "what may well be the single worst command decision of the Great War." That blows it a bit out of proportion, but it really was not a very good move for de Langle to abandon the Woevre. The first problem was simply that it represented a retreat for the French from positions that were not even being threatened by the Germans. The Germans were able to move their front lines forward about 10 kilometers which shortened the German lines at Verdun and gave them another axis on which they could position heavy artillery against the Verdun salient. This retreat got a lot of criticism both during and after the war and Joffre was lucky, or perhaps he planned it all along, that de Langle would receive most of the blame. Regardless of whether this move was a good one it happened, and it was completed by 10:30PM on February 25th. During discussions at French Headquarters on the night of the 24th of February Castelnau was concerned about the situation at Verdun, his concern was that even if the French managed to stop the Germans they were desperately short of men in the area and so he suggested moving the entire Second Army to Verdun. The Second Army was at this moment out of the line and resting in Normandy after their role in the French fall offensives and they were commanded by none other than General Henri-Philippe Petain. On the night of the 24th, along with requesting that the Second Army be moved to Verdun Castelnau also wanted to go to Verdun himself to evaluate the situation. Castelnau also requested that he be given authority to do whatever he though necessary without having to check with Joffre first. Joffre agreed to this request and in his memoirs says that after he agreed he also advised Castelnau to only abandon the city if he thought that it was absolutely necessary. Joffre, while fully aware that this step may be required if the situation began deteriorating at a faster pace, knew that it would not be a popular decision. 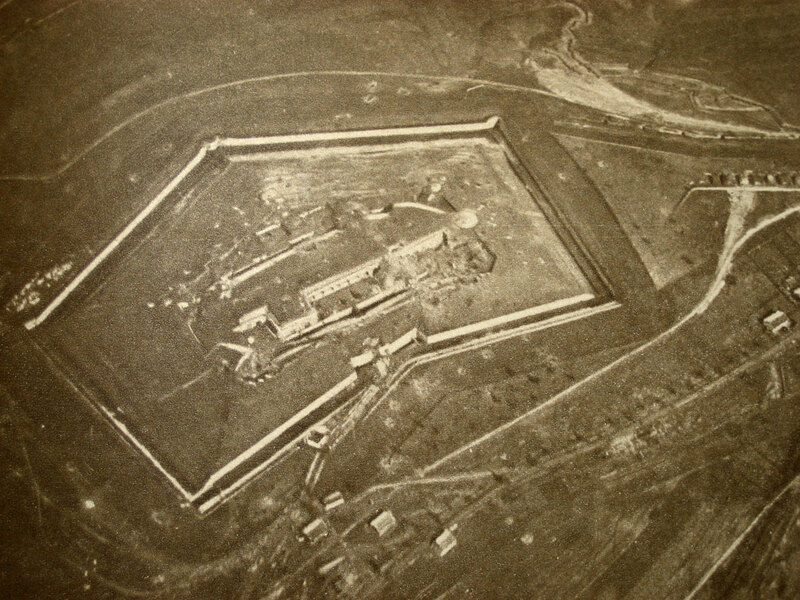 Joffre never would order Verdun to be abandoned, which was important for him in the long summer months when pressure began to mount for him to be replaced. On the ground at Verdun Herr was actually beginning preparations to abandon the city. He had already ordered all support troops over to the West Bank and also ordered all permanent fortifications to be rigged for demolition when the time came to abandon them. Both of these moves were made to facilitate a quick and easy move to the other Bank, away from the German attack and away from the city. With Castelnau on the way to Verdun Joffre ordered Herr to halt these preparations, and to wait for Castelnau to arrive. Early in the morning of the 25th Castelnau arrived first at de Langle's headquarters. His goal at these headquarters was to just talk about the situation, calm everybody down, and then phone ahead to Herr to reiterate the need to not voluntarily give up any more ground to the Germans at the moment. He then moved onto Verdun where he arrived several hours. After he arrived he spent most of the day discussing the situation with Herr and his staff to try and determine the best course of action. After his evaluation de Castelnau made a fateful decision, and oddly enough exactly the one Falkenhayn was hoping for. He decided that the French should stand and fight on the east bank, they would fight for every foot of ground. He would have ordered the city to be abandoned and the French to retreat behind the city into the defensive terrain behind, but he did not and become of that he would set the tempo for the rest of the campaign. This move was keeping with French doctrine at the time and also squared with de Castelnau's firm belief that the best strategy for the French was to attack, and keep attacking even if they found themselves pushed back temporarily. Another factor that de Castelnau had to consider was if the French forces were even capable of an orderly retreat at this point. The worst thing that could happen was for a retreat to turn into a disorganized and panic driven rout. Castelnau also suggested to Herr that French reinforcements, who were arriving all the time now, not be fed into the line as quickly as they had been up to this point. Waiting for larger units to arrive and organize would allow the French to counter attack and in general make the reinforcements more useful. The final decision that Castelnau made was his most impactful, one that he would telephone directly to Joffre. He was going to put Petain in command of all of the French troops at Verdun, this included any troops on the East and West bank and any further troops that would arrive. General Herr would be relieved of his position, Castelnau did not think very highly of him, although he had been put in an impossible situation from the start. With all of these decisions made Castelnau sent a message to Petain to prepare himself and the second army to move to Verdun and told Herr to defend the right bank at any cost until Petain arrived. Then Castelnau, his part played in the Verdun story, departed. By 1916 Petain had a relationship with the troops under his command that was unique among all of the French army commanders. His particular leadership style, and his dedication to the belief that firepower was the deciding factor on the battlefield was part of this relationship. It could best be exemplified in the belief by the troops under his command that if Petain was asking them to attack then he saw a reason, a chance of success, and he would not just throw them away. Petain fostered this belief with frequent, often unplanned, visits to the front, he made a point of presenting medals to the troops in person, and he was known to enquire about the wounded right after battles. In Price of Glory, Alistair Horne would say about the situation that Petain now found himself in "It was the tragic fate that because of the terms of reference to which de Castelnau had committed to him in advance, this unqiuely humanitarian general would be called upon to subject the men under his command to what was shortly to become the most inhuman conflict of the whole war." The order to report to French HQ for assignment to Verdun reached Petain while he was in Paris and while he was visiting his mistress in a hotel at the time. Yes, Petain was quite the lady's man, yes he had at least one mistress in Paris, yes he visited her frequently. He would find his way to Headquarters early the next morning. When he arrived he was told to move to Verdun and that the whole of the Second Army would be following along behind him. He was given the task by Joffre to "Rally the troops of the Fortified Region of Verdun…if they are compelled to withdraw to the west bank; Prevent the enemy from crossing the Meuse River." This was before Castelnau's decision to hold the east bank at any cost had been made. Petain would only find out about that decision when he arrived at Verdun. As Petain approached Verdun what he saw could not have been an encouraging sight, hordes of refugees, broken pieces of units, and countless wounded were streaming out of the Verdun salient while convoys of reinforcements and smaller groups of replacements were trying to move in. The situation on the roads was a disaster with the traffic sometimes barely moving for hours at a time. Petain was only able to reach Herr's headquarters at 7PM on the Fifth Day and what he found there was a commander on the verge of a breakdown. Herr was completely unable to stand the strain of his command and the worst part was this caused his staff to also be ineffective. Petain found that here was no solid information on simple items like the Corps and Divisional boundaries and there was no up to date map of troops positions and also no order log being kept up to date so that Petain could know what was happening. In this atmosphere of confusion he officially took command at 11PM, just in time for the first bit of really concrete news to arrive from the front, Douaumont had fallen, and it was very clear that Petain had a long road ahead of him. According to G.J. Meyers in A World Undone "The appointment of Pétain put Verdun in the hands of a man who, probably more than any other in the French army, was capable of organizing an effective defense while at the same time protecting his troops from unnecessary destruction." When Petain met Castelnau he was given some handwritten orders to take command and to hold the East Bank at all costs. The first thing Petain did was send out a message to General Balfourier of the 20th Corps that he had taken over command and that he had complete confidence in him. He also ordered the 20th Corps to defend the territory that they currently occupied. When the formal operational order was drafted and sent out later it would read “The mission of Second Army is to stop at any price the en- emy effort on the Verdun front. Every time the enemy wrests a parcel of terrain from us, an immediate counterattack will take place.” With this order the game was now set, the French would be defending everything, and counter attack if anything was lost. They had fallen into Falkenhayn's trap hook, line, and sinker. The only question now as, would it result in the outcome that the German commander desired? After issuing his brief orders to the commanders Petain found a chair and slept for a few hours. However, the room that he slept in was unheated and it got very very cold during the night so in the morning he awoke with a high fever. After a doctor was called in and evaluated Petain he declared that Petain was suffering from double pneumonia, this meant that he would be bed-ridden for over a week. Petain made it very clear to his staff that his condition should be kept a secret from everyone and only a small number of his staff were able to even meet with him, and he rarely left his room for the next stage of the battle. At the front he trusted his Chief of Staff and Aide de Camp to be his eyes and ears, they would meet with commanders and then report back to Petain. This made the opening week of his command even harder than it already was for Petain. Petain would spend most of the next severael days just trying to get a good handle on the situation in front of him. He would write in his memoirs that at this point “Between the forts and beyond, everything was in a state of dilapidation. Trenches had collapsed, the network of barbed-wire . . . was in pieces, roads had turned into swamps, and matériel lay scattered about.” Surprisingly, but perhaps also predictably, he did not think that the situation was as desperate as many other did. First of all, Petain was not being called upon to get the French to resist, the soldiers were already doing that on their own. What was required him was instead to try and channel resistance into one coherent effort and to back it up with resources so that it had a greater chance of success. Part of the process of coordinating resistance was to establish some positions and stick to them, and this also meant that he was writing off anything that had already been taken and that included For Douaumont which had seen a series of counter attacks since it had fallen. He ordered the counter attacks to cease and for the French to dig in on the other side. There were two essentials that he identified in the early days that would be the driving factor in most of his decisions. The first was to coordinate the artillery to again made it an effective force on the battlefied and to accomplish this he took personal command of all of it. For the first time the French guns would start coordinating their fire in larger groups than just each battery. Petain also altered their orders and told the guns to be aggressive and to his the Germans while they were attacking. This had the obvious physical benefit of hitting the Germans while they were in the open but more importantly it let the French troops seem the effects of the artillery, to see that they had the guns behind them. For the first time the French infantry would be able to believe that when the Germans attacked they would have some help, for an army that had been beaten like a government mule for 5 days, this morale boost was huge. The other critical piece of Petain's plan was to get the supply lines sorted out and organized. Doing this was the only way he could hope to feed the men and guns. He worked over the coming week to bring up enough supplies so that the artillery and infantry would be able to fight for 14 days in case they were cut off form resupply for any length of time. These two large efforts were accompanied by an endless stream of other orders and decision. He designated sectors along the front with letters and assigned them to the commanders allowing for some sort of order to be created out of the mess. He began to move men and guns back into the fortresses and strongholds along the front, and made sure that they were incorporated into the unified command structure so that there would not be a repeat of Douaumont. Finally, he made sure that the demolition mines were neutralized as they would no longer be needed. While some of these decisions were bold, Petain had a few things going for him that made it all possible. First of all he had men arriving at Verdun constantly, the 20th Corps was now all committed to the line and the 1st Corps were moving in behind them. By the 26th, the day after Douaumont fell Petain would have 14.5 divisions under his command and that would increase to over 20 in the next week. It got to the point very soon where, given the limited geographical area under his command, he had to request that GQG stop sending more troops and instead send him more heavy artillery. With some of these extra troops he was able to order the construction of four lines of resistancce. The first line would be held only by a few troops and it was 300 to 500 meters in front of the second line which was the primary point of resistance. The third line would a reserve line with the fourth being the last line of resistance which Petain drew on a map and said there would be absolutely no retreat from it. One small administrative change was to also given Petain command of the third army which was adjacent to the Second Army now in the line. This would allow him to simplify support services in the area by combining the supply and transportation assets of both armies into supplying Verdun. One of those decisions that Petain made that I just sort of brushed past was getting supplies to the front, I did not mention all of the problems that were present in trying to make this happen. For any continued resistance by the French troops they were problems that would have to be solved, there were soon to be 9 French Army Corps in and around Verdun and they had to be supplied. The only way to move these supplies into Verdun was a narrow gauge railways and a second class road that both led into the city. The road was one that ran north from the town of Bar-Le-Duc four about 40 miles and it would come to be called the Sacred Way due to how important it was for the French. For most of the battle the road and the railway were the sole ways to get supplies into Verdun. Before the fighting the railway was used to bring in about 400 tons of munitions per day but the rate of consumption during the fighting would require ten times that amount. Even with the railway maxed out completely the road would still have to be used to make up the difference. Supply trucks were brought into Bar-le-Duc in great number, 3,500 in all, and they would begin running up and down the road non-stop. An average of 1,700 trucks would make the 80 mile round trip every single day, on a normal day that meant a truck every 25 seconds. However, when it was required the traffic would almost double with a truck every 14 seconds. To keep the traffic flowing at this pace Petain sent Major Richard who laid down some very strict rules for the road all of which were designed with one goal in mind, to keep traffic flowing, no matter what. Any stalled vehicle was quickly moved to the roadside and groups of engineers were assigned to keep the trucks running through repairs or removal. The engineers were also supposed to repair the road when necessary, which was not a huge task early on when the road was frozen, however when the temperature rose and the ground began to thaw the road quickly turned into a muddy quagmire. Major Richard requisitioned the help of territorial troops that were moving to the front and they were given the task of hurling gravel and stones onto the road in an attempt to create a solid enough base for the trucks to keep moving. The battle of keeping traffic moving would last throughout the battle and at the peak of the fighting there would be 15,000 men, an entire division, dedicated just to road maintenance because without the road and the ability to keep supplies flowing Verdun would have been over very quickly. Another part of Petain's plan for Verdun was a constant rotation of troops in and out of Verdun. This was not just a simple matter of rotating troops in and out of the front but also in and out of the sector completely. This was a process that began in March and would run throughout the entire battle. Petain's goal, instead of leaving units at the front or at Verdun until they were unable to offer resistance he would replace them while they were still coherent fighting units. This was great for Petain and the defense of Verdun because it greatly increased the morale and fighting capabilities of the French troops there at any given time but Joffre was not such a huge fan. By moving troops in and out of Verdun it was constantly sapping the strength of so many units that he wanted to use in future attacks. Joffre's frustration would just build and build after March 7th with Petain requested for a corps, then another corps, then so on and so forth. Petain also did not want new recruits fresh from training depots and he did not want units to go through Verdun more than once. All of these facts meant that the rotations at Verdun would have far reaching consequences. The first was that the Germans were constantly facing new and refreshed troops. This made the French seem limitless with their manpower because they were always attacking against a new set of Frenchmen. It also meant that the German High Command were constantly over estimating French casualties since they believed they had caused enough casualties for the French to have to move the units out of the line instead of doing it voluntarily. Finally, on the French side this created a collective experience in the French army that was more powerful than any other battle. Over the course of the 10 months of fighting 125 divisions, fully 3/4 of the total number of French soldiers had rotated through Verdun. This is part of why Verdun occupies such an important role in French society, just the sheer number of men who experienced the horror of it. While Petain was busy putting all of these new processes and procedures in place and getting supplies sorted out and getting the artillery to do something one question kept nagging at him. Why were the Germans not attacking on the left bank? Why only on the right? And what would the French do if they did start attacking on both sides of the river? Would it reset the French back to the panicky atmosphere of the first few days of fighting? These questions and many more will be answered next week.